Alexander Thomson Hotel occupies a grand red sandstone Victorian building close to Central Station, the M8 motorway and Glasgow's financial district. Also close by are many boutique shops and top restaurants and bars that Glasgow has become famous for. Whether you're staying for business or pleasure, this hotel makes an excellent choice for the budget guest. Rooms are cosy, and include WiFi and a traditional Scottish breakfast. For seeing Glasgow from the thick of the activity and buzz, it offers just about everything needed for a fine old time in Scotland's most dynamic city. Great news! Finding this page means you can now join our VIP list for Alexander Thomson Hotel. 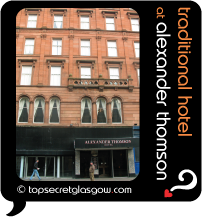 Grab your very own web page all about Alexander Thomson Hotel. Do you have a special story about Alexander Thomson Hotel? A funny experience? A grand occasion? A funky photo? A personal tip? A top secret? Alexander Thomson Hotel has 24 hour front desk service.